OLDEST FAIR IN FAYETTE COUNTY! During the 1920's 4-H Club activities began in the Wooddale area of Bullskin Township. The annual Round-ups or Field Days were held at the Mudd School near Paradise Church. These events gave interested local leaders the idea of sponsoring a fair. The 1928 fair was held on October 20 at the Pennsville Baptist Church. The 1929 fair was held on November 16 at the Pennsville Baptist Church. These early fairs were held late in the year so that grains, corn, potatoes, and apples could be exhibited. 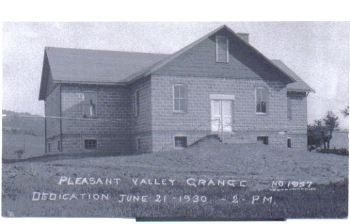 The new Grange Hall was completed in the Spring of 1930 and the dedication of the building was held on June 21, 1930. Plans were set in order to hold the annual fair in the new building. All exhibits were set up in the basement of the Grange, including poultry! The following year a poultry barn was built and several stalls were added so livestock could be shown as well. These early fairs ran for three days. By 1937 the fair had developed to such an extent that it was decided to form the Pleasant Valley Grange Community Fair Association. During the summer of 1937 a large livestock barn was built. Later an addition was added to the end of the barn for the 4-H Saddle Club and a shed was added along the side for ponies. Since the early days, a lot of new buildings have been added, arena area improved, the fair association purchased the Grange Hall, and the fair operates a full six days. Since the 1960's the fairs name was changed to the Bullskin Township Community Fair.